Our esteemed and valued clients can avail a huge variety of Hip Barrel Plate implants sets from us, which are designed and developed in compliance with the industry standards. 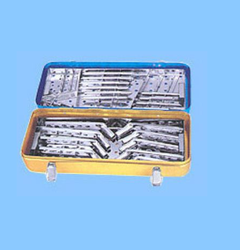 We have made the use of technologically advanced machinery and optimum grade raw materials in fabrication of these sets, which help in improving their strength and quality. Our range is delivered in proper packaging. Hip Barrel Plate implants set. Aluminum case, blue, with yellow lid, perforated Tray for Plates & Tray for Screws. Lag Screws 50mm 1 No. Lag Screws 55mm 2 Nos. Lag Screws 60mm 2 Nos. Lag Screws 65mm 1 No. Condylar Barrel Plate 95°6 Holes 1 No. Condylar Barrel Plate 95°8 Holes 2 Nos. Condylar Barrel Plate 95°10 Holes 2 Nos. Condylar Barrel Plate 95°12 Holes 1 No. Looking for “Hip Barrel Plate implants set”?